One of my favorite things about traveling is that it makes you feel like the world is one big community. International competitions do the same thing. 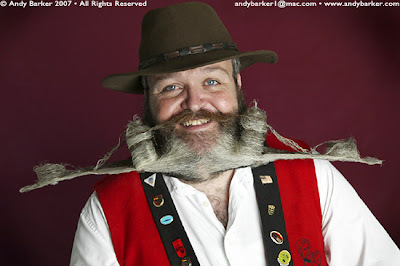 Last week I blogged about the Cannes Film Festival, last summer I blogged about the World Cup, and today I blog about the World Beard and Moustache Championship. The event took place in Norway over the weekend and included 160 competitors from many different countries. There were 14 competition categories, ranging from natural goatee to sideburns freestyle. The ultimate goal is the prize for overall best facial hair. This year a German man named Elmar Weisser won the honor. He had a beard in the shape of a moose (see below). This was the third time Elmar has won the Championship. I thought his moose beard was amazing enough, but I actually prefer his previous two winning beards because they’re travel-related. The first was a beard in the shape of the Brandenburg Gate in Berlin, and the second was in the shape of London’s Tower Bridge. This guy has awesome beards. Though no other facial hair at the competition seemed to approach the level of Elmar’s, there were definitely plenty of noteworthy beards, mustaches and goatees sported. The World Beard and Moustache Championship occurs once every two years. One can’t help but wonder what Elmar will come up with in 2013.